The avocado is widely considered a vegetable since it is commonly used in salads. However, it is actually a fruit that tastes like a vegetable, and most markets display it with other typical fruits. The rich, pale yellow-green flesh of the pear-shaped fruit has a texture likened to a firm ripe banana, smooth and buttery, with a faintly nutty flavor. Avocado, avacado, alligator pear, avocado pear, Fuerte, Gwen, Hass, Pinkerton, Reed, Zutano, aguacate, avocat, abacate, ahuacatl. Although the prime season for fresh avocados is late winter/early spring, they are readily available in markets year-round. Avocados do not ripen until picked, so fresh ones will be as hard as rocks. Look for an even and unblemished texture, uniformly hard or soft over its entire surface. They should feel heavy for their size. Avoid any with bruises or soft spots and those with a hollow between the flesh and skin. Shake the avocado to test. If the pit is loose, reject it. The flesh of ripe fruits will yield when pressed gently. Ripe fruits bruise easily in the markets. It's best to ripen your own at home. 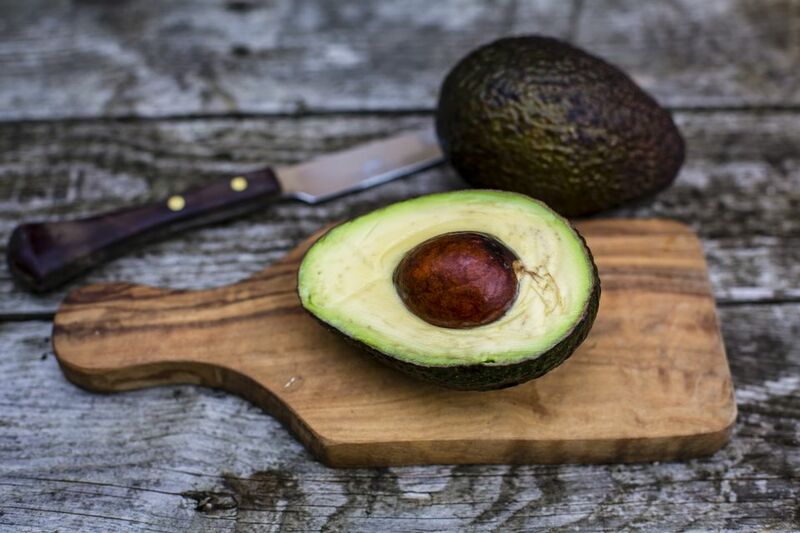 There are hundreds of varieties of avocados, but most cooks develop a preference for a particular breed. The Haas avocado is a particular favorite with many chefs. Avocados are available fresh and as a frozen puree in some areas. Do not store unripened fruit in the refrigerator. Ripe fruit may be stored in the vegetable drawer in the refrigerator for up to 10 days. To freeze avocado, puree flesh with 1 tablespoon of lemon juice per 2 avocados, and place in a tightly-closed container with the air removed. Frozen avocado can be kept three to six months at 0 degrees F.
Avocados can weigh from 1 ounce to up to 4 pounds each. To ripen, place the avocado(s) in a brown paper bag and store at room temperature for 2 to 5 days, away from direct sunlight. Adding an apple or banana to the bag will hasten the ripening process. The flesh of the avocado quickly begins to darken when exposed to the air. The addition of an acid, usually lemon, retards the darkening process. Avocado Cooking Information. Learn about how to cook with avocados. Choosing the Perfect Batch of Eggs is Crucial. Here Are a Few Tips!